DJ Khaled drops off a new single titled “You Don’t Want These Problems” which will be showcased on his upcoming Suffering From Success LP. 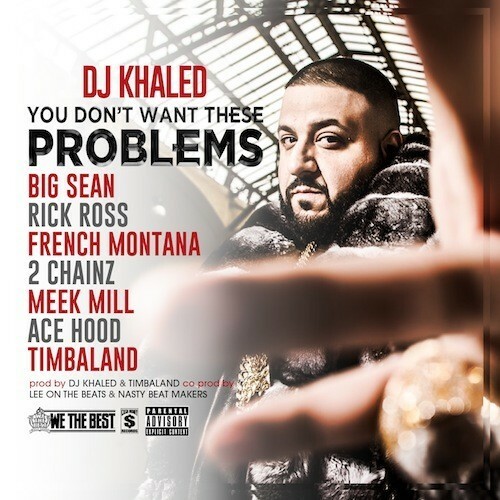 Equipped with pounding drums and the occasional guitar rift, “You Don’t Want These Problems” skips the potential need for a chorus and instead boasts the lyrical talents of Big Seam, Rick Ross, French Montana, 2 Chainz, Meek Mill and Ace Hood as the artists attack the menacing instrumental with braggadocios bars. Take a listen as Khaled’s latest offering turns up the energy and showcases its street anthem potential. This entry was posted in Audio and tagged 2 chainz, ace hood, big sean, French Montana, hip hop, meek mill, rap, Rick ross, timbaland, you don't want these problems. Bookmark the permalink.